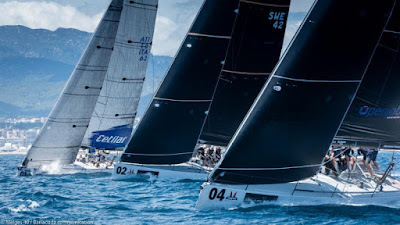 (3 May 2018 / Palma de Mallorca, Spain) - The 2018 Melges 40 Grand Prix is off to a magnificent start, hosted for the very first time at Sail Racing PalmaVela. Three races in perfect, breezy conditions allowed the Melges 40 to shine ultra bright today. Every team looked extra sharp as they have all worked hard, training and tuning over the long winter break in preparation for an intense PalmaVela, 2018 Grand Prix circuit start. If anything, today's competition was indicative of what is yet to come this season - three races produced three different winners, keeping the ranking very narrow. The best out of the starting blocks in Race One was Richard Goransson's INGA FROM SWEDEN with Cameron Appleton as tactician. Their impressive speed and angle upwind in particular, gave them a massive head start. With each leg, Goransson and team extended taking an undisputed win. "It was a great start for INGA. Our speed is much better than last year, which is a direct result of strong teamwork," said Goransson. "As for Palma, the place is fantastic. The wind conditions here are ideal, and the event organization by Real Club Nautico de Palma is incredible. The Melges 40 Class is extremely balanced and every race is a story in itself. There is a great mix of performance, and the technical level here is what makes it such a unique Class." Race Two featured a close battle between Goransson and Valentin Zavadnikov's DYNAMIQ SYNERGY with Michele Ivaldi on tactics. In the end, Zavadnikov out-maneuvered the fleet getting ahead to take the win. The third and final race of the day witnessed another aggressive performance by Goransson, this time calling out Italy's Alessandro Rombelli at the helm of STIG with Francesco Bruni serving as tactician. Winner of the 2017 Melges 40 Grand Prix Circuit, Rombelli came on strong during the latter part of the race, successfully putting some separation between himself and Goransson. Aiding his winning effort, Goransson ran out of wind falling back to finish fourth, but still leads the general classification after three heats. Tomorrow, Sail Racing PalmaVela continues with more Melges 40 Grand Prix 2018 racing. The Melges 40 Grand Prix circuit is thrilled to be supported by Helly Hansen, Garmin Marine (official timekeeper), and Melges Europe. Melges 40 Grand Prix has signed and adopts the code of ethics of the Charta Smerarlda strongly promoting the values of One Ocean Foundation.